Deceived... Cleaners are good ...rest of the staff no customer service at all...prices of food deceiving with all this stupid taxes...overall hate this place .....middle of nowhere.. If you have just decided on a West India holiday, breathe easy! lastminute.co.nz has a heap of groovy hotel and apartment options in Mumbai. Check out the 272 places to base yourself within 10 kilometres of Mumbai's centre. Location is everything when it comes to trouble-free vacationing, so check out the Holiday Inn Mumbai International Airport and Keys Hotel Nestor, which are located within a 1-kilometre radius of the town centre. Boasting 49 hotels, Andheri East is a popular hotel neighbourhood that is a good place to stay. You'll find Andheri East 3 kilometres from Mumbai's downtown. 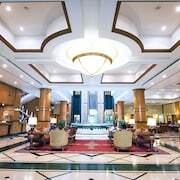 The Courtyard by Marriott Mumbai International Airport and Sai Palace Hotel are just a few recommended hotels in Andheri East. Colaba and Fort - Churchgate - CST are other options. 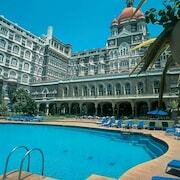 The The Taj Mahal Palace Mumbai and Ascot Hotel are in Colaba. The West End Hotel and Grand Hotel are in Fort - Churchgate - CST. Juhu Beach is 7 kilometres from Mumbai's downtown, while Chhatrapati Shivaji International Airport is 2 kilometres from central Mumbai. 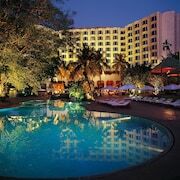 The JW Marriott Mumbai Juhu and Novotel Mumbai Juhu Beach can be found in Juhu Beach, while The Residency and The Leela Mumbai are located in Chhatrapati Shivaji International Airport. 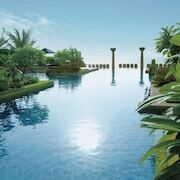 The Four Seasons Hotel Mumbai is positioned 15 kilometres from the main part of Mumbai. 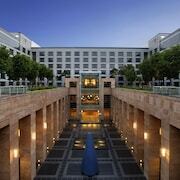 Alternatively, the ITC Maratha Mumbai can be found 2 kilometres away. Another possibility is to check out the rates and amenities at the Hilton Mumbai International Airport or the Hotel Marine Plaza. Thinking you might like to explore a bit further afield? You've picked the right place! West India offers plenty of other awesome places to check out. 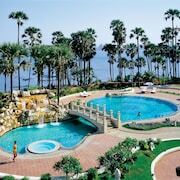 Visit the ruins in West India, or simply head off with that someone special and admire its beaches and coastal plains. Popular activities in this part of India include hiking, caving and cycling. It is well known that Australians are pretty laid back, so consider extending your stay and check out the Bhaja Caves and Lohgad Fort, which you'll find in Lonavala, 65 kilometres to the southeast of Mumbai. If you'd like to spend a few nights in Lonavala, check out the The Upper Deck Resort and Della Resorts. 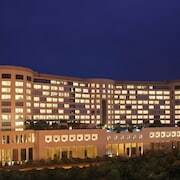 17 kilometres to the east of Mumbai is Navi Mumbai, which is home to the Royal Tulip Navi Mumbai and ibis Navi Mumbai. The Inorbit Mall and Utsav Chowk are popular attractions to see while in Navi Mumbai. Just because you're far from home, doesn't mean you can't enjoy your obsession for sport. You'll find Wankhede Stadium 20 kilometres to the south of Mumbai. The The Taj Mahal Palace Mumbai and the The Oberoi Mumbai are close to the action. Chhatrapati Shivaji International Airport is the most used airport for arriving in Mumbai and is 2 kilometres drive from the centre of town. 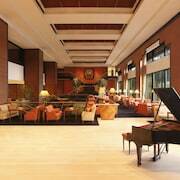 If you choose to stay nearby, try the The Residency or the The Leela Mumbai.